Yaniv "Nev" Schulman is a professional photographer who lives and works in New York. After a picture he took of two people dancing on top of a roof is featured in a magazine, he receives an e-mail from an 8-year old girl named Abby. Abby lives in rural Michigan, but was so taken with Nev's photo that she paints her own version, which she then sends to Nev. This initiates a correspondence which gradually leads Nev to come to know the members of Abby's family, specifically her 19-year old sister Megan. It was as Nev was beginning to get to know Megan that Nev's brother Ariel ("Rel") and their friend Henry Joost decided to start documenting their burgeoning relationship, from their first phone call until they were, in essence, dating, despite having never been in the same room as each other. 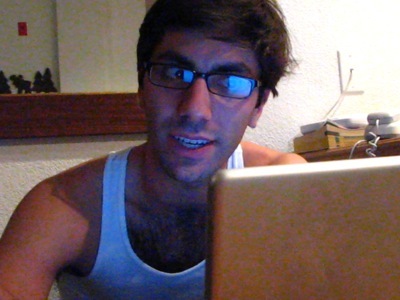 Catfish, the resulting film, follows Nev as he begins to have suspicions about Megan and her family, and charts the three friends' efforts to travel to Ishpeming, Michigan to meet them. So much of the discussion surrounding Catfish since it debuted at the Sundance Film Festival back in January has been about whether or not the film is actually real, a fabrication or some hybrid that the most important questions about the film seem to have gone unasked; is it interesting, and does it have something to say? Regardless of which side of the debate you eventually fall on, the film is an entertaining and provocative work that asks some pointed questions about living your life online. At the centre of Catfish is a question that cut to the heart of social networking sites (specifically, Facebook, which plays host to much of Nev's correspondence with Megan) and, in a broader sense, all online interaction; can you really say that you know someone if you only communicate with them through text? Aaron Sorkin, the writer of The Social Network, which Catfish makes an interesting companion piece to, described social networking as a kind of performance since people are able to shape the way in which they are perceived by their virtual community, ensuring that people perceive them only through a lens of their own creation. This is an idea that recurs frequently in Catfish. Having already name-checked one David Fincher film in this review, I'll go for broke and reference another; the first rule of Catfish is that you don't talk about Catfish. Specifically, you don't talk about the second half of the film. This has been a central pillar of the film's advertising for months now - one of the original taglines for the film was "Don't tell anyone what it is" - and with good reason. Paul Thomas Anderson coined the term "gearshift movie" to describe a film which starts off going in one direction, then suddenly heads off in quite another partway through (the classic example being Psycho) and that term definitely applies to Catfish, since it starts out as an oddball romance, then changes into something else entirely. Knowing that there is such a shift won't ruin the experience, since knowing there is a change coming but not knowing what is coming gives the film a queasy tension that is quite exhilarating, but knowing the specifics would probably harm the experience so I will not reveal anything else about what actually happens in the film. Unfortunately, that puts me in a bind, since all the stuff I don't like about the film falls in the second half. Even more precisely, it falls into the last twenty minutes or so. To put it in the vaguest possible terms, there is a veritable tsunami of explanation in the last twenty minutes that all but destroys the energy that the film builds up over the first hour. There are nice moments in there that are insightful, but for the most part it feels like padding to get the film up to feature length. It's also in this section that the other controversial aspect of the film rears its head, which is the question of whether or not Schulman and Joost exploited some of their subjects for the purpose of the narrative. I don't know if they did anything untoward whilst filming, and there doesn't seem to be anything to support the notion that they did, but the way in which the footage is presented verges on the distasteful at time and makes some sequences feel uncomfortable in a way which I do not think was intended. Again, I don't want to go into specifics, but anyone who has seen the film will know what I mean. Those aspects of the film aside, I thought that, much like that other great "is it a hoax?" film Exit Through The Gift Shop, it is entertaining, invigorating and insightful in its own, playful way. Finally, since everyone seems to need to have an opinion on Catfish, I think that it is real, but that the film-makers have manipulated the footage in order to create a more compelling narrative. Then again, that describes just about every documentary ever made, so I don't see why people should get so worked up about it.